Safe sample storage is assured with this next generation European build quality ULT. Unique internal shelving configuration enables the fastest chamber temperature pull down times and uniformity. Advanced, classic dual compressor cascade workhorse using readily available, traditional, non-flammable natural refrigerants. The 7 inch touch screen user interface offers full connectivity, traceability and sample security. Monitoring maintenance and nine alarm conditions, economy mode, onboard downloadable temp data / chart. The microprocessor system controls operational conditions via two (not one) RTD Pt 100 Ohm independent sensors. Options include CO2 back up, RFID access control, advanced voltage stabilizer, racking and inventory. For piece of mind, all Euroclone KW cold storage products are backed by an extended warranty and LAF Technologies own in house service maintenance programs. IT systems connectivity, IQ / OQ GMP installation programs are also available through LAF Technologies EMS validation engineering team. The range includes under bench ULT right through to Upright 806 litre capacity models. Double door, dual cascade, chest and bespoke on request freezer systems are also available. LAF Technologies also stocks and supports in service a full range of KW laboratory refrigerators and -30C laboratory freezers. Founded in 1953, KW Scientific is an expert scientific refrigeration company that dedicates much R & D and innovation into producing quality products that are both reliable and energy efficient and with as little environmental impact as possible, specifically for biomedical, scientific, research and Industrial sectors. 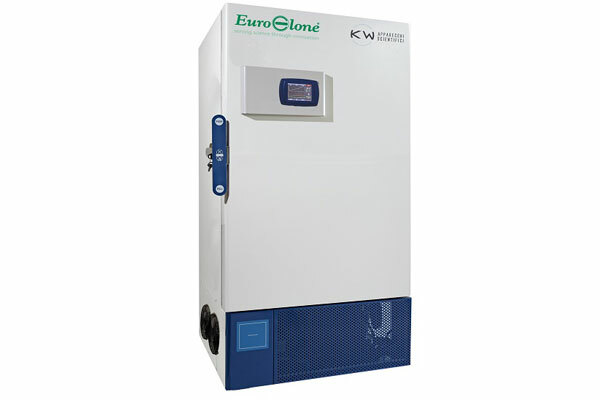 The Euroclone KW R & D team is dedicated to verifying performance (stability and uniformity of T and UR %), energy consumption, eco compatibility, with particular attention to the latest technology regarding refrigerants and energy regulation. Please do not hesitate to contact us for further detailed product information and competitive pricing. If you would like to put one of these products to the test, Demo systems are available for trial. Rental options including service support are also available.